I’ve trained, worked with and lived with German Shepherds and German Shepherd puppies for decades. And, let me assure you that if you train your German Shepherd incorrectly, or neglect training completely, you will end up with an aggressive dog or a fearful behavioral mess. 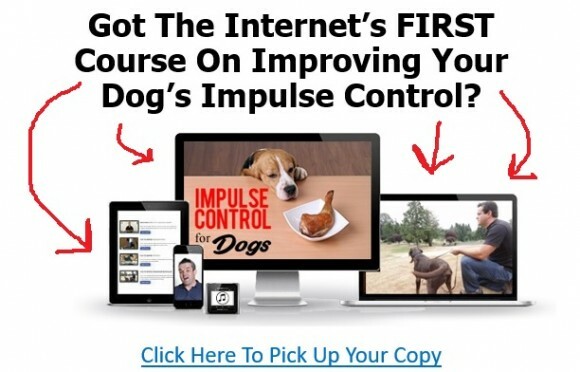 Most dog training programs, as of late, completely ignore Impulse Control, which is essential for a high drive, biting puppy that is expected to become a good canine companion. 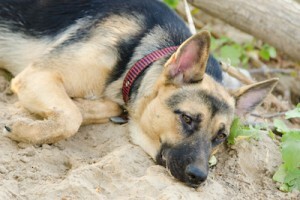 German Shepherd Dogs are very emotionally sensitive dogs. They have been bred to be emotionally and intellectually connected to their trainer so that they can be efficient dogs for police, military and other K9 training. As such, traditional, correction based training can completely emotionally shut down, over stimulate, or create fear in this breed. 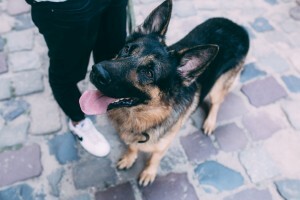 Meaning, leash corrections will make some German Shepherds afraid of training and making mistakes; and it can make other with stronger personalities lash out in aggressive behaviors trying to bite their owner for using the leash incorrectly or introducing pain. Taking a new German Shepherd puppy or new dog to obedience classes before training them at home, is ineffective. Puppies need to learn obedience and impulse control in a boring and distraction-free environment. Taking puppies, who haven’t received any kind of training, to “puppy class” and expecting them to learn new concepts is like taking your 2nd grader to Chuck E. Cheese with his friends and expecting to sit him down and teach him a new math concept. Don’t get me wrong! I am ALL ABOUT dog obedience classes, but I want my dog to learn at home and be set up for success when I add that kind of stress and distraction! I have had friends, whose dogs have won obedience titles and trophies and look AMAZING on the field, but who would steal food off the table or knee cap you going down stairs. It was like they learned obedience “conditionally’. They were obedient in certain circumstances and certain conditions, but had no idea how to cap their “drive” or control their basic impulses. The majority of our German Shepherd Dogs aren’t going to be working dogs living in kennels. Most of us want a good companion. But, our dogs’ brains are wired differently. They get too impulsive or too excited and have a hard time controlling themselves. I have lived with these guys and Belgian Malinois and Dutch Shepherds for decades. I understand that these breeds have a serious lack of impulse control genetically. These genetics, help the German Shepherd be an amazing police K9 but make it miserable to live with a puppy that lacks bite inhibition! These guys need to learn, from an early age that biting and snatching isn’t a part of family life! Raising this kind of dog isn’t easy! If you don’t follow some basic rules and ideals you will set yourself and your dog up for failure! And, the good news is, that if you are consistent you will see immediate results. Your puppy is only young once. You have a limited amount of time to expose him to the world while he is learning to freely accept the things around him. Skittish German Shepherds are abundant, and no one wants a 90 pound dog that lacks socialization that can lead to aggression. Nor does anyone want a large dog that runs from everything he visually doesn’t understand (things in his environment that can scare him). But, you need to take the steps to give your puppy the training to achieve that confidence. And, remember; with socialization you have a limited amount of time before your dog is older and less able to socialize without some resistance. Be sure not to just turn him loose at the dog park or with children you don’t know. It is crucial to control his social experiences and make them positive. Socialization doesn’t mean “reckless abandon” or he might have a negative experience that could carry him through life. I can’t tell you how many people “try” crate training for the first 2 nights and then simply “give up”. Or that amount of people who simply refuse to crate train! 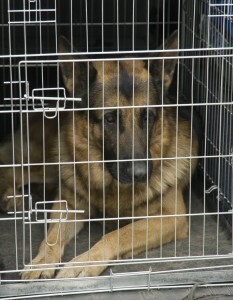 In order to have a well developed, well socialized and good canine companion, you need a dog that is happy in a crate. Because at some point your dog will be in a crate: at the vet, the groomer, or pet sitter’s home. He can’t avoid being in a crate for the rest of his life. And, wouldn’t it be nice if you gave him the skills to not be bothered no matter where he is at? I work at a veterinary clinic and occasionally take my dogs to work. My Fury is so comfortable in a crate or cage that she flips upside-down and sleeps. Not a stress in the world. I also crate them when we go to sporting events. I have competed in agility, obedience, dock diving, lure coursing, and protection sports and there isn’t a single venue where having your dog out of a crate all day is appropriate. Crates also give me more options to travel. Not only will some family only allow me and my dogs to visit if they are crated when I am gone, some motel/hotels that don’t allow pets will allow your dog with a crate too. There really isn’t any reason NOT to crate train. Remember all puppies will throw a fit for a few nights, just like all babies have trouble transitioning from a crib to a bed or just out of their parent’s bed. However short term fits are better than a lifetime of chewed articles and a dog that has some separation issues because he is never alone and never expected to do things he doesn’t want to do. After all, life is full of things we think we don’t want to do, but then realize we actually like them or see the benefit to them. Imagine if we allowed children to just decide they didn’t want to go to school, because they didn’t like being away from home or just couldn’t get along with the other kids. Don’t allow your puppy to dictate how you will live your life, or what kind of dog they end up being. I think people are under the impression that puppies break from the womb with an understanding of leash manners and training. It is as if, leashing them at home and around the house isn’t even considered. Usually, the first time they are introduced to a leash is when the person is trying to walk them outside. Some puppies buck and resist the leash. 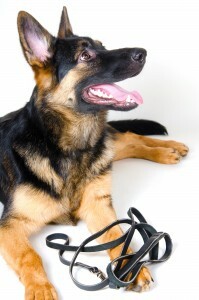 Most German Shepherd puppies, however, are confident and more likely to pull on the leash toward things that excite them. Neither of these behaviors is ideal. One of the most important skills you will need throughout the life of your dog is appropriate leash manners. Ironically, I worked with a lady, years ago, whose 2 German Shepherds had pulled her down and broke her arm in 2 places. It is sad that she didn’t teach and instill better understanding of the leash and training in her German Shepherd puppies so that she wouldn’t later have to endure the pain and physical therapy of a broken arm. The best place to learn, new and important behavior is at home! Leash manners and training is no different. When I trained Service Dogs for people with disabilities we would tether those puppies and adult dogs to us in the home. This tether allowed us to keep bad behavior, like stealing items or jumping on the counter, from ever really happening consistently. Did you know you can actually create a dog that has possession aggression issues? And, German Shepherd Dogs, like similarly trained protection dogs are genetically more predisposed to be possessive. The drive to possess an item is actually something that many breeders breed for, sounds crazy right? Until you realize that these highly trained K9s need to want to “possess” the bad guy in the bite suit. I have seen puppies literally wrap their arms around an item and try to swallow it, which is a highly desirable trait in these protection dogs. So, chances are, your dog is already predisposed to some of these feelings. Now, if you do the wrong things, you will strengthen this bad behavior. The difference is that your dog isn’t likely to chase and capture bad guys, instead he is going to threaten to bite YOU or your children! If you are always getting in his face and stealing the things he thinks he has worked for as he gets bigger he might just challenge you and your children. Don’t put yourself in that predicament. It is easier to exchange and item and avoid conflict. German Shepherd Dogs typically have an incalculably high prey drive. Remember that description of the K9 chasing the bad guy? 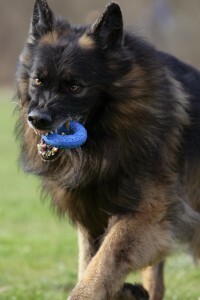 German Shepherd Dogs easily learn this game because they have a high prey drive. Chasing the man, is like chasing a bunny or a cat. It is a genetic instinct in many of these K9 chosen breeds. Most people think that in order to control their dog’s prey drive, they should teach their dog to ignore it all together, which is practically inconceivable! 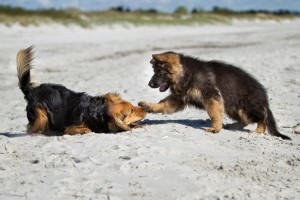 The best way to teach your dog to control his instincts is to BUILD them and then add control! The Border Collies in Scotland, don’t chase sheep at their own whim, they also don’t kill them. Their prey drive is built and then they are taught if they want to play with the sheep; that they must learn to control it! I use a ball on a string to build my dog’s prey drive. Then I can use that ball as a reward for good behavior. 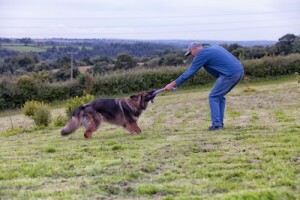 Check out how easily this little boy controls his Belgian Malinois (much like a German Shepherd) with a toy https://thedogtrainingsecret.com/blog/joys-positive-reinforcement-drive-training/ His obedience is simply amazing! German Shepherd Dogs have been bred to care about their human companions. They bond fast and hard. The problem is that most people don’t notice or pay much attention when their dogs look up or back at them. Let’s face it, after a while my dog is going to realize I am not THE MOST exciting thing in his world. I mean, how can I compete with a squirrel or the neighbor kid? Unless, I reward him and play with him and convince him early on that “I” am KING and have everything he needs to keep him happy. THE fastest way to teach your dog that you aren’t the most exciting thing on earth, is to let him run, alone off leash. I think we can agree, that being off leash and chasing wild animals at will, eating wild animal poop and all around exploring on your own is the best thing on earth! I mean, who doesn’t want to run around with a little reckless abandon, every now and again? But, if you allow your German Shepherd puppy to run off leash without the obedience to back it up, you will struggle with his obedience for years to come. Again, whether it is true or not, I want my dog to think that I am THE BEST thing on earth. And, I simply cannot compete with wild critters and exciting smells. That doesn’t mean that your German Shepherd will never be able to be off leash; the opposite is true. You just need to control his environment, play with him and build his drive for toys and games, and then teach him obedience. So, when he goes off leash, he will have the obedience background to leave whatever distraction may crop up. I have called my dogs off baby bunnies and opossums among other exciting things. The reason I was successful, is because my dogs know if they listen and obey they will be rewarded (mostly with a game of ball which is their favorite thing). They never learn how fun chasing bunnies can be if they don’t listen. And, let’s face it, bunnies are more rewarding than me… I just want to be smarter than my dog 😉 and never give him the opportunity to figure that out. Most often it is because people inadvertently, create it. Again, manners and especially leash manners should be taught at home. Tether your dog to you, early on, to avoid bad behavior and teach some leash respect and manners. Never allow your German Shepherd puppy to get in the habit of pulling you to and fro when he is on the leash. 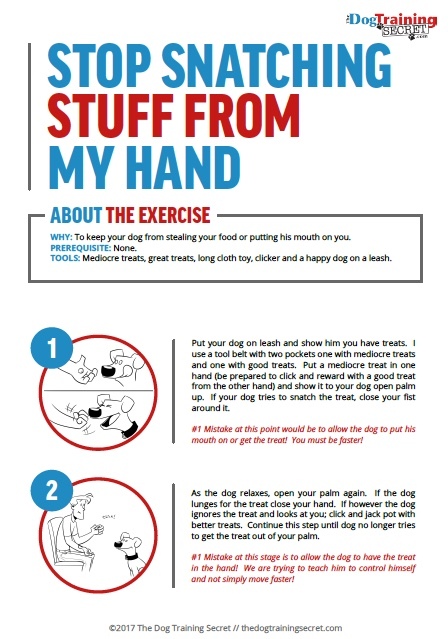 A lot of times when the human is walking their dog and they see something the dog is likely to react and pull toward, the human stiffens up and pulls the dog in closer. 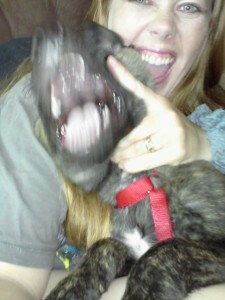 The human’s heart rate is likely to raise and they may yell, correct or even hit their dog. This teaches the dog that “other dogs or people” or whatever the distraction is, brings pain and makes his human act fearful and odd. The dog associates the “thing” with something negative and so he connects negatively and emotionally to it each time he sees it. He begins to get defensive and even aggressive whenever this new “trigger” comes into his view. As people, we think reeling our dogs closer and correcting them when we see other dogs or people is what we should be doing; but you are only negatively conditioning the “thing” for your dog. In essence, you are creating reactivity, fear and even aggression. It is a lot easier to give your dog coping mechanisms and obedience so that he can ignore anything that comes into his environment without becoming fearful or forging any king of negative emotion to things. But too much demanding and monotonous exercise can be dangerous of German Shepherd puppies. German Shepherds are prone to hip dysplasia and other degenerative joint diseases, genetically. And, there are two big factors in degenerative joint disease; genetics and over exercise when the puppies are developing. You can’t help genetics, but you can search for the best genetic candidate who has been certified to have excellent hips. You have a better chance of avoiding genetic hip dysplasia and joint disease if both parents have “excellent” OFA certified hips. And, you can avoid demanding, monotonous exercise (regular exercise on soft surfaces will not hurt). Years ago, when agility was taking the world by storm, people began training their puppies earlier and earlier for agility trials. They soon found that a large number of those puppies who started out young, were developing shoulder, hip and spine problems. The pounding of the shoulders coming off of the A-Frame and Dog Walk. The impact of the hips that continuously caught the dog over jumps. And, the way the spine curved around the weave poles created permanent damage and curvature. We realized, what we did while our puppies developed into adults was important! It was crucial to allow the body to form before adding strenuous exercise regiments. I love teaching my dogs to pull tires and trikes; but I wait until they are adults and they have been cleared through x-rays to do so. That will create a whole other problem with lack of socialization, exposure and needed exercise. Puppies can run on soft grass, they can calmly climb stairs and they can go on long walks. But avoid rigorous running on hard surfaces, consistent jumping or anything else that will specifically stress joints. Potty training is serious business! More dogs are dropped off for euthanasia at shelters for potty training problems than any other issue! So, first off, take it serious! You want to think “prevention”, rather than just dealing with the problem. I’ve heard people say “It’s easier to just clean it up”. And many want to rely on “potty pads” (which I personally think are counterintuitive). But these both set your dog up for failure! Thankfully, most German Shepherd puppies are fairly easy to potty train, but remember it is really all about YOU! And, be sure to keep your puppy with you! If he is in the same room with you all the time, you will notice if he begins to sniff or squat so you can get him outside. When he is not with you, he should be in his crate. Also, go outside with him to make sure that he is getting his business done! Many times puppies get outside and get distracted with everything going on outside that they forget to go potty. You need to know what your puppy is doing and what his potty schedule is like so that you can set yourself and him up for success! Heck I am excited for you, since I am, after all, a German Shepherd fan! Your life is about to be enriched in a way that only a great and loyal dog can do! And, because you have spent this time, reading and studying and doing all that you can to set your pup up for success I know that you will both be successful! You know what to do and what not to do!